Emeryville is a little over one square mile of urban flatlands and landfill, wedged between Berkeley, Oakland, and the San Francisco Bay in California. All of 5,000 or so people live there. 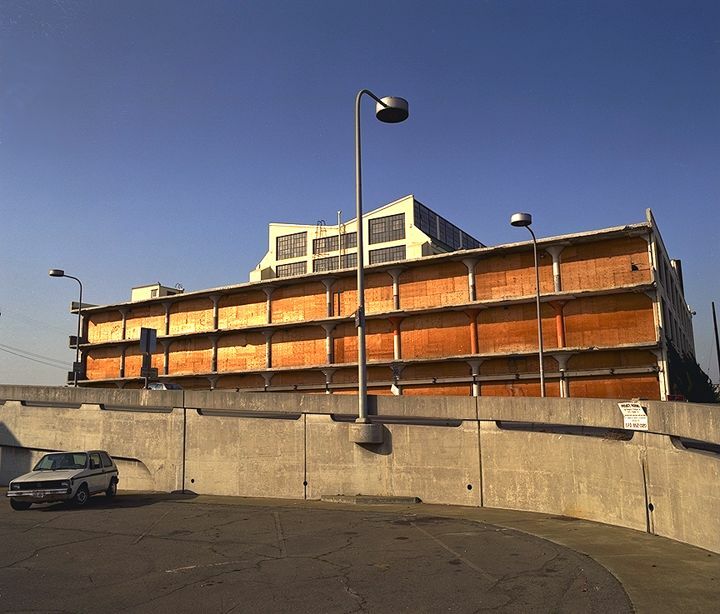 Like millions of other Bay Area people, I first noticed it (in 1985) only because it had a single rather tall and imposing building next to the freeway; no other city along the I-80 corridor in the area has any comparably tall buildings at all. A couple of years later I both lived and worked in E'ville, and I've followed the city since as it transformed itself from a small city with steelworks, assorted heavy industry, gambling (one of the very few places in California where gambling was legal), and a big crime problem, into a thriving little hi-tech center with a bunch of busy malls, a couple of decent restaurants, and a lot of refurbished factories and warehouses. 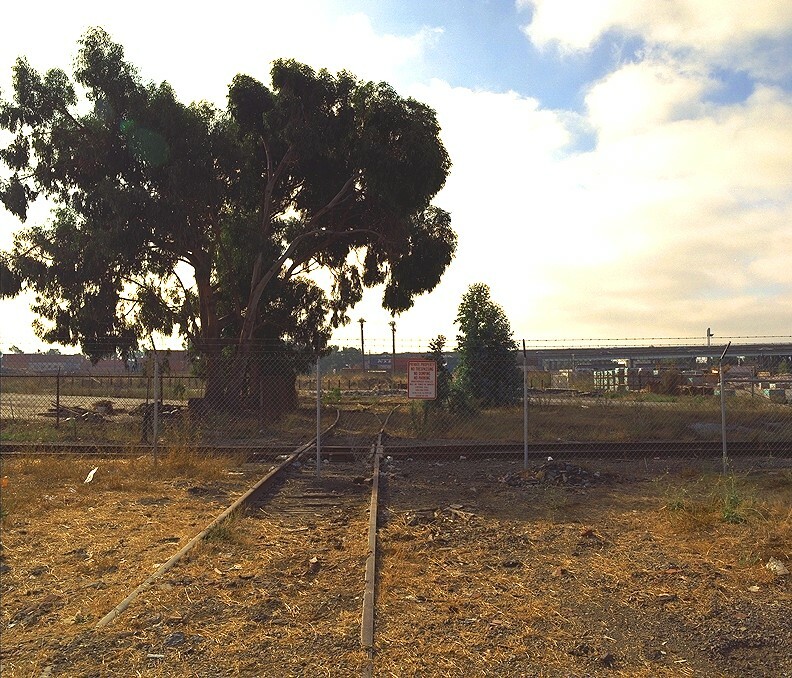 Emeryville was the sort of industrial town that still had working railroad tracks running down the middle of city streets and into the factory sidings (some of these are still in use in 2002). Until recently if you wanted to walk from the east side (say Hollis Street) to the west side (The Marketplace) you simply walked across the main Southern Pacific north-south railroad tracks, sometimes quite literally stepping through a stopped freight train. 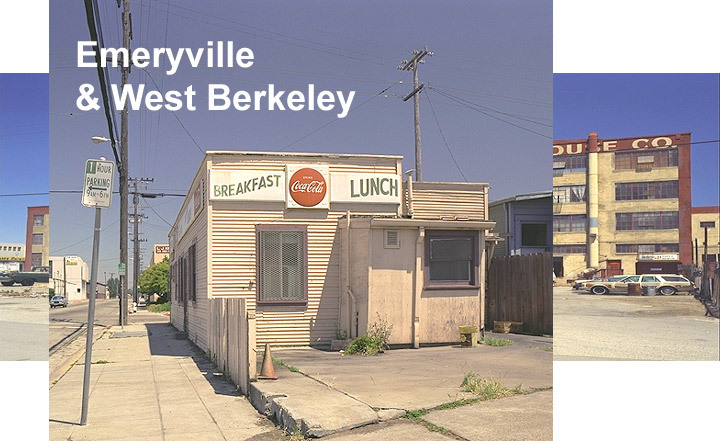 (Update: sometime later this year (2002), I'll probably try to do a before / after version of this page -- E'ville and West Berkeley has changed almost beyond recognition since I took most of these photos). 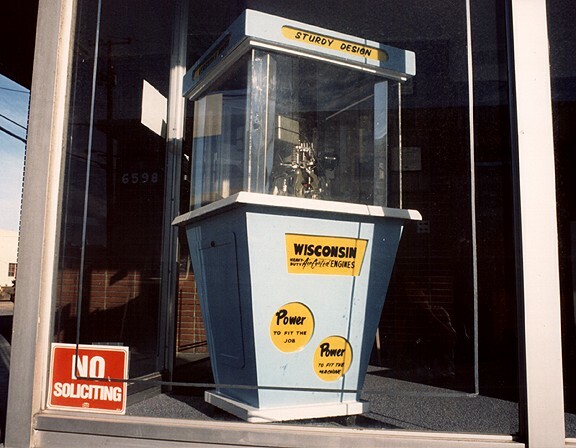 One of the canonical Emeryville experiences used to be coming across junk sculptures on one of the (many) vacant toxic waste sites and landfills in Emeryville. This one is just one of many that sprung up overnight on the landward side of Interstate 80, lasted a few weeks, then disappeared. Public art at its best. In the background you can see the old Barbary Coast Steel Mills, still semi-operational when the photo was taken. One of the original artist's warehouses in E'ville. Once full of musicians, sculptors, potters, artists, and sundry others who rented space here for studios, rehearsal space, etc., the Warehouse is in danger of being renovated and turned into low-cost housing (it could have been worse, it could have been turned into some god-awful yupperie with boutique coffee and bagels, etc....). It's a better location for workspace -- right next to the railway and Sherwin Williams' 24hour truck depot -- but that never stopped E'ville.... I once drove past here about 6am one Sunday to take photos and there was already a lone drummer thrashing away with the windows open. It was the sort of place you could see dueling robots in the parking lot or buy custom pottery upstairs. Emeryville's beautiful old town hall. The new one is in the anonymous Watergate complex off Powell Street; the old building seems to be used for little more than storage. This building is redolent of the old Emeryville rather than the cute "Old Emeryville" that the new Emeryville likes to promote and get nostalgic for with names like "Emery Bay" and "Emery Commons" (I keep waiting for "Mt Emery"...). 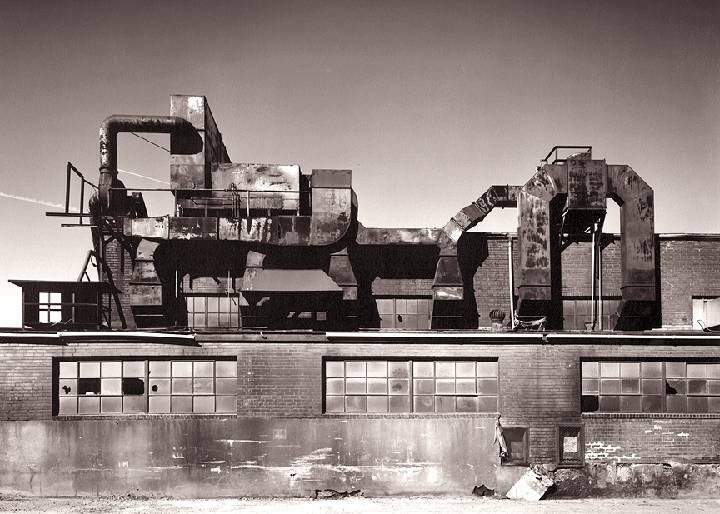 The real old Emeryville was a steelworks and gambling town that (soon to be Chief Justice) Warren Burger once called the crookedest town on the West Coast. Most of Emeryville west of the railroad is landfill and toxic waste from Berkeley and Oakland. It used to be that wherever you saw all those acres of open space, you could be pretty sure it must be toxic (why else would otherwise prime business and industrial land lie fallow?). This particular site (next to the now-closed pigment factory that used to emit some of the highest air-borne heavy metal concentrations in the country) is now being developed, but it was always reassuring to see the guys in space suits who came out every year or so to take soil and air samples. 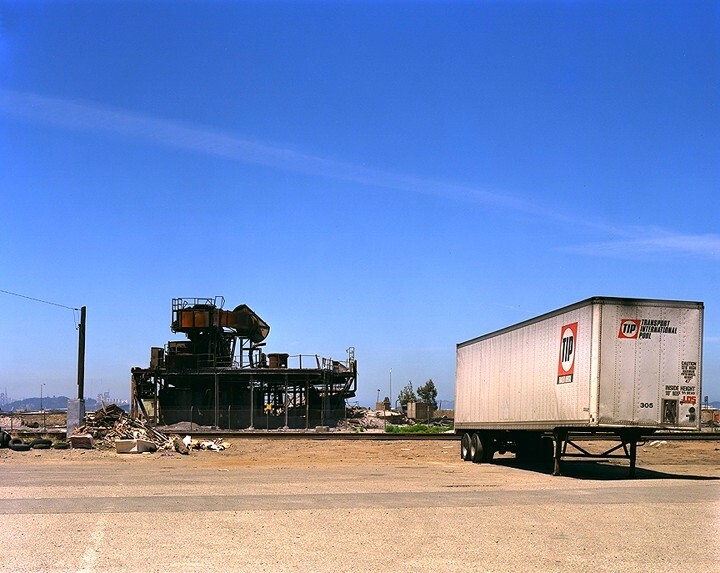 Speaking of sunsets and toxic waste... this is the old Transformer Factory a year or two after the Loma Prieta quake. 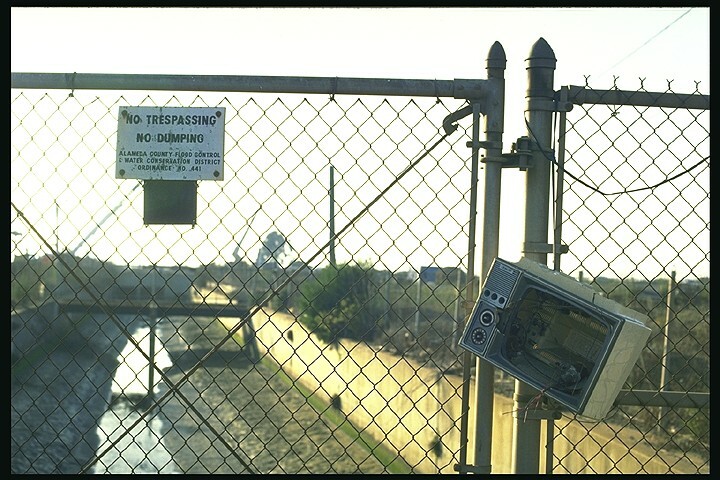 Already abandoned, it was waiting for final toxic waste clearance (all those PCBs from the transformers, etc.) 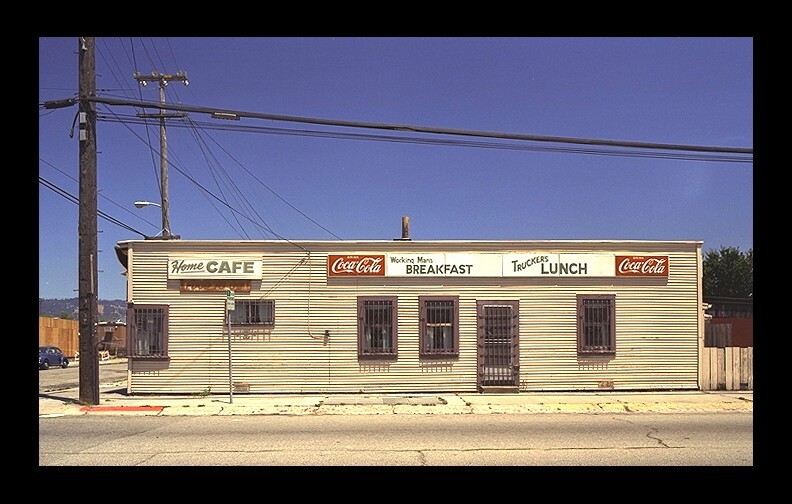 before being redeveloped or torn down, when the quake hit. The front of the building here crumbled and cracked badly and threatened to topple onto the Powell Street overpass (Emeryville's Main Street!). Unfortunately, according to E'ville legend, there was too much waste still around (there were always lots of 55 gallon drums with yellow toxic waste stickers around this site...) to just demolish the thing safely, so they had to prop it all up with wood and steel wiring and gingerly get the waste out of there over the next two years (we're talking men in spacesuits again -- we used to have "alien landings" jokes down pat). 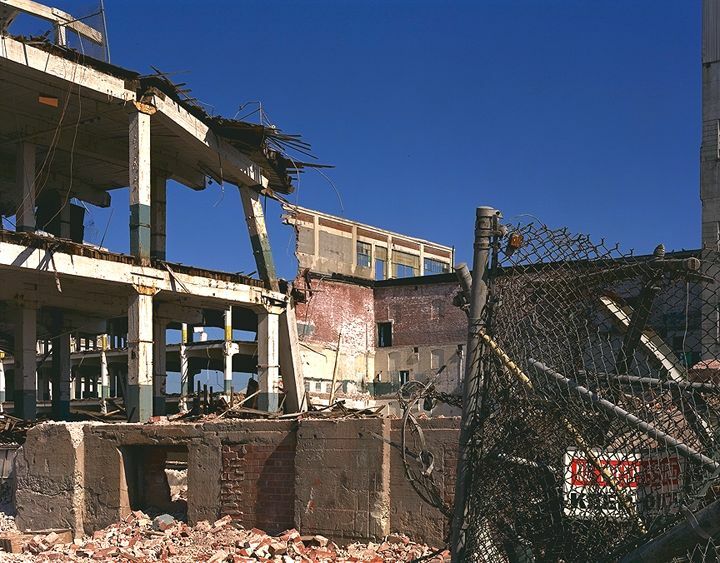 Then it was demolished and part of it became the overnight sensation that is Emeryville Amtrak station. But that's another (very Emeryville) story. Part of the PQ (Philadelphia Quartz) plant in West Berkeley, with the partially-derelict old soap factory in the background. I once showed this photo to a friend in Sydney who looked at it intensely and said slowly "Ah! The American Dream". I'm not quite sure what he meant, but it felt right. Another authentic Berkeley experience in severe danger of becoming a yupperie (a few years ago they even started advertising cappucinos...). Once in the middle of a whole slew of factories, warehouses, foundries, etc., it's now mostly surrounded by expensive boutique woodwork and pottery places, and challenged by the several very hip cafes that have opened up in the area. On a good day it's right in the path of the plume of the rather-too-white ...smoke?... that comes out of the PQ Factory across the way. 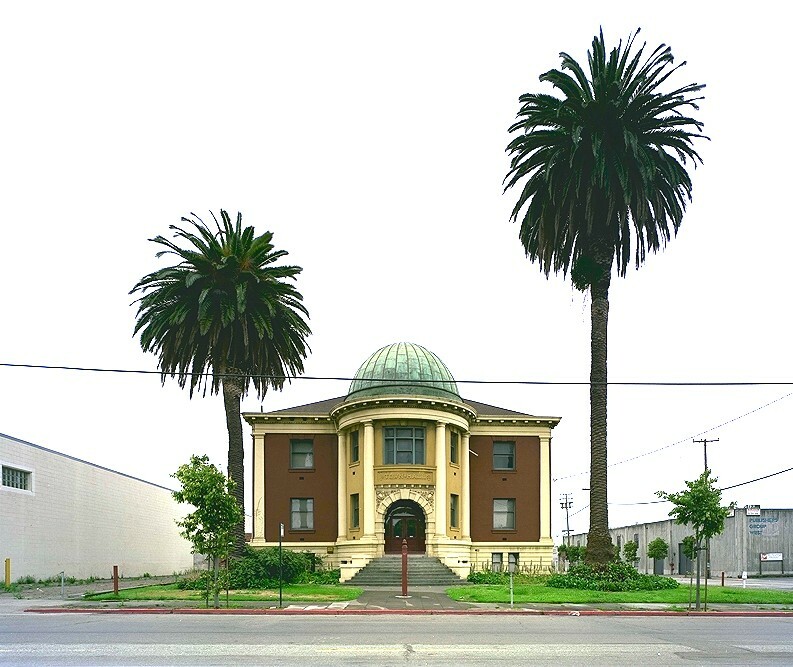 A still-vital and active foundry -- in Berkeley. 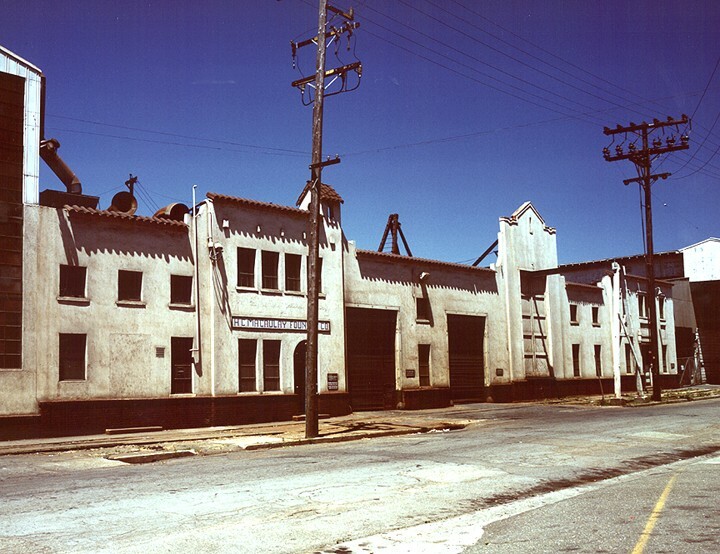 Both Emeryville and Berkeley have working foundries and forges. In the early '90's I used to ride my bicycle past Coulter's in Emeryville on my way to work in the mornings and see showers of sparks coming from open-mouth furnaces and hear the hammers bashing away against the anvils. Macaulay's has been tarted up in the last year or two, but until recently it used to look like this - something out of a Mediteranean or Mexican film from the 1940's. The whole place used to have the look of a plywood movie set -- barely a straight angle anywhere -- and looked as though it'd blow over in the next storm. Inside there was an astonishing array of industrial gear and custom castings covered in a various layers and textures of grease and grime (I never got a shot inside, even though I befriended the security guard who took me on something of a tour -- it was one of those sights it's better to leave in the mind rather than rush around trying to take...). 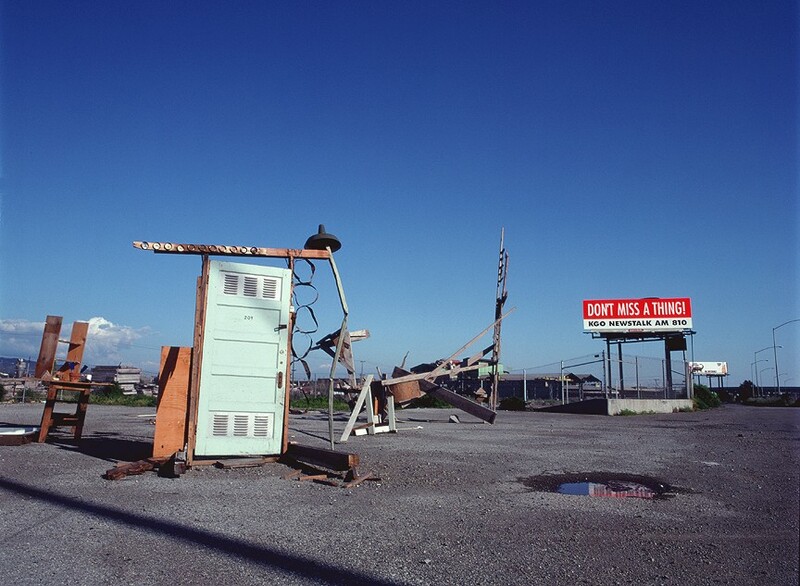 Probably my favourite Emeryville photo. 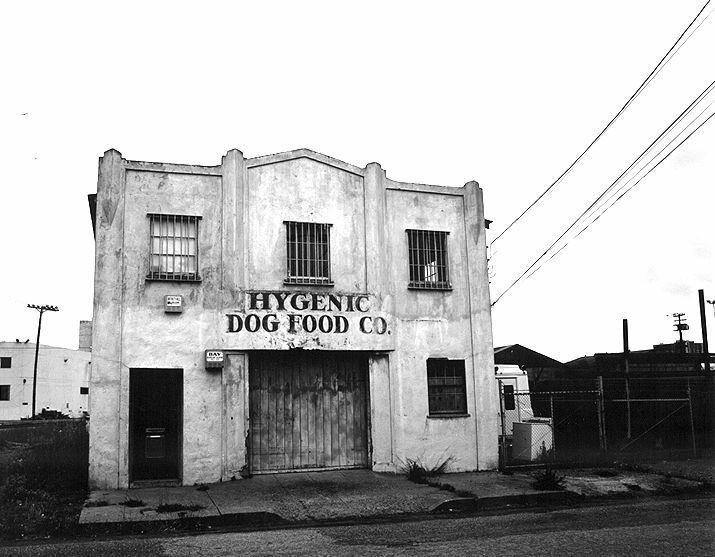 Says a great deal about the Emeryville of the 1980's. Needless to say not only is the tree not there any more, there's the vast East Bay Bridge mall and associated cheap condos that sprang up almost overnight in the middle-distance. 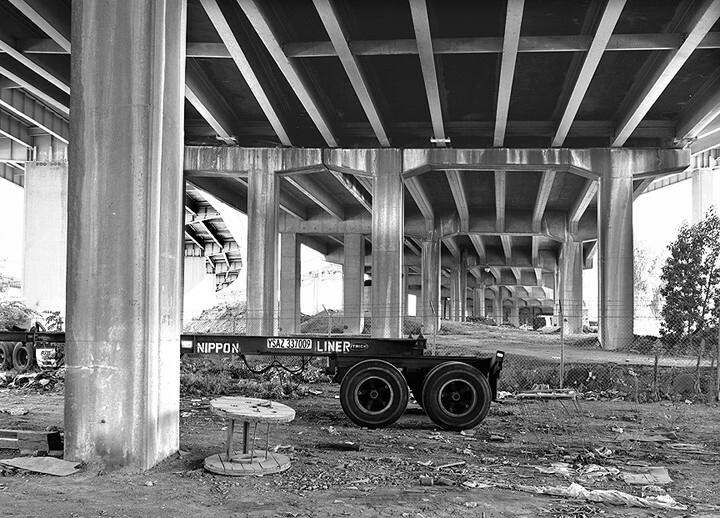 I caught this trailer lurking under the freeway on the Oakland / E'ville border. There are so many of these detached trailers and wheel units around the area they seem to outnumber humans -- they're the natural inhabitants of this area (and they only seem to move at night). 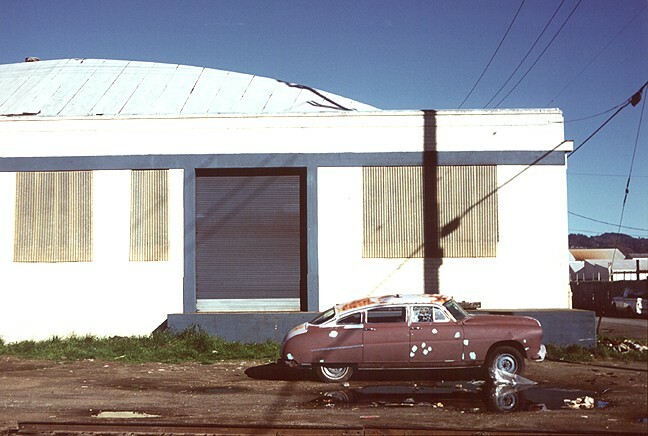 I once conceived of doing a "Wildlife of Emeryville" photo essay full of all the trailers, dead couches, abandoned cars, rusted stoves and toxic waste barrels, shot at night with a large flash unit. The first night out I got a few shots before the E'ville police department rushed one of their cars over to investigate reports of someone doing something suspicious out near the Pigment Factory. Well, I was trespassing, but they'd encountered me before, and took it with good humour (a carefully-used Anglo-Australian accent will get you out of a lot of trouble here...). Unfortunately I never really picked it back up again, and now the main wildlife seems to be Volvos, BMWs, and shiny mountain bikes. More Emeryville / West Berkeley wildlife. (I guess I just have a thing about dead cars). 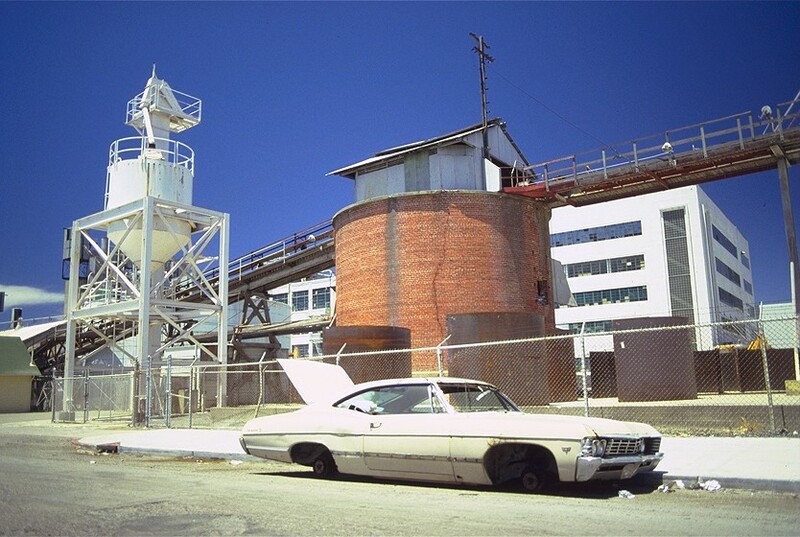 The image on the right is a view from the Emeryville Warehouse, with one of the partially-dismantled furnaces from the Barbary Coast Steel mill in the mid-background. Even more wildlife (this is where old truck trailers go to die, apparently). 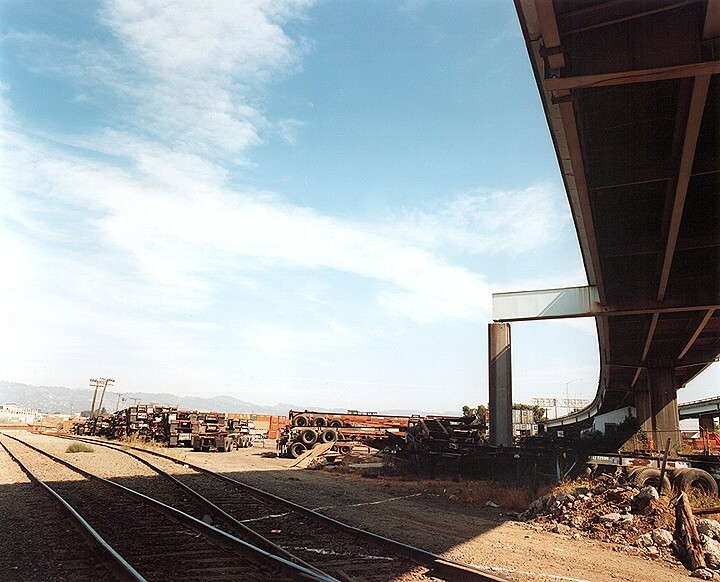 Canonical late 1980's / early 1990's Emeryville / West Oakland landscape -- soaring curved freeways, railroad tracks to nowhere, pre-mall open ground, bent telegraph poles, red-yellow dirt, shopping carts, several small dead fridges, and not a human in sight. Very little in this picture still exists, either unchanged or at all -- even the freeway here has been moved and rebuilt -- and there's a huge mall now right where the falling-over telegraph poles are. If you want to see how Emeryville wants to present itself, visit the City of Emeryville Home Page or (yes! Emeryville even has its own .net domain!) 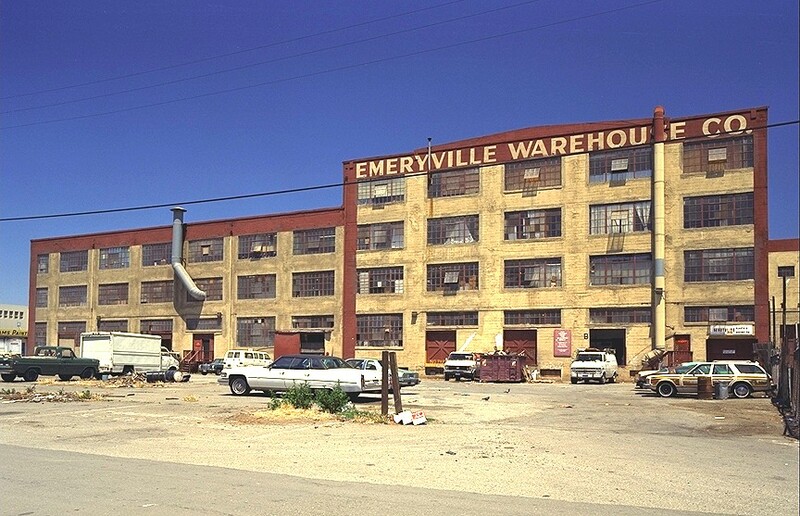 Emeryville.Net, the more commercial of the two sites currently devoted to E'ville. Berkeley, of course, also has its own inBerkeley: City of Berkeley Home Page. Fascinating stuff.